Tezpur, the cultural capital of Assam is situated on the northern banks of Brahmaputra. Tezpur has archaeological remains dated back to the 4th century. Tezpur, with a rich history has tremendous potential for tourism, which in turn can make it one of the most decorated cities in India. Seeing the opportunities beneath this small beautiful town, Swapnil Tembe, an IAS and the Assistant Commissioner of Sonitpur district decided to do something for the betterment of Tezpur. Swapnil Tembe posted on Facebook seeking volunteers to work on different areas, meant for the overall development of the town and its residents. Within no time he received a huge response from the people of Tezpur. The mighty Brahmaputra river looks extremely stunning from the circuit house where Mr. Swapnil resides. But, the river banks were dirty!! He immediately took action, and with the help of the volunteers he made a major cleanliness drive at Jahajghat. That is how ‘Volunteer for Tezpur’ or ‘V4T’ group was formed, under the leadership of the young IAS, Swapnil Tembe. There are more than 150 members in the V4T group, which includes students, businessman and the other class of people. Apart from Mr. Tembe, the ADC of Sonitpur district Mr. Parag Mahanta is also actively involved in the group. The V4T which was just formed in January 2017 has already taken up many exemplary steps. In February 2017, a blood donation camp was organized. The group has been providing free computer teaching at an orphanage. They had also raised a good sum of money which will be used for the education of underprivileged children. Another noteworthy step taken by the team is to promote cycling. 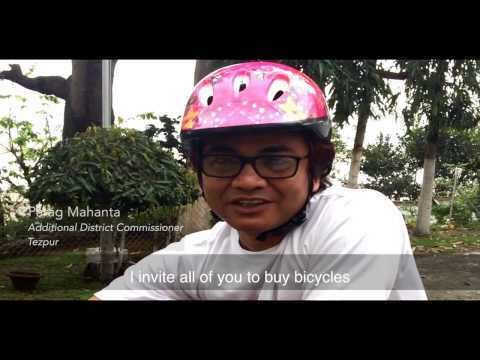 Concerning for both the health and environment, the team has been encouraging people to use bicycles. In order to motivate and create awareness, they periodically organize cycling trips to nearby areas like Nameri, Dhekiajuli etc. This particular initiative brought a positive change among the natives, especially among students. People have started considering bicycle as a primary medium of transport. Motivated by V4T, a group of students from Tezpur College had also taken pledges to promote cycling. V4T has also taken initiative to spread awareness among people to avoid usage of plastic bags. District administration is planning to distribute reusable cloth and paper bags to the vendors. Very soon Volunteer for Tezpur will be a registered NGO, as revealed by Swapnil Tembe. He also hopes to develop Tezpur’s tourism and take up different progressive steps through V4T, which will indeed benefit Tezpur as a whole. Come on Tezpur, Let's cycle!